We’d love your help. Let us know what’s wrong with this preview of Dangerous River by R.M. Patterson. To ask other readers questions about Dangerous River, please sign up. Am amazing tale. Tells the story of exploring and trapping along the Nahanni River in the Northwest Territories in 1927-29. Great adventures. Fabulous writing. Really captures the magnificence and awe of the land. R.M. Patterson’s “Dangerous River” is an enchanting tale of one man’s travels along the remote South Nahanni River (≈300 mile long) in the far reaches of Canada, above British Columbia on the west side of the Northwest Territories. The tale was written in the 1950s but was the story of his two adventures that took place in the 1920s, way before many roads were available to ease the journey and to an area where few white men had ever ventured. Just to reach the region from Edmonton in the 1920s t R.M. Patterson’s “Dangerous River” is an enchanting tale of one man’s travels along the remote South Nahanni River (≈300 mile long) in the far reaches of Canada, above British Columbia on the west side of the Northwest Territories. The tale was written in the 1950s but was the story of his two adventures that took place in the 1920s, way before many roads were available to ease the journey and to an area where few white men had ever ventured. Just to reach the region from Edmonton in the 1920s took over two months of travel. Once in the Northwest Territories Patterson made most of the trip by water, canoeing up rivers to reach the Nahanni and largely living off the land. The book itself is a wonder…written in the first person from his diary and filled with arresting characters, some who preceded him and some that he met and befriended along the way. The narrative is a detailed chronicle of his explorations, replete with descriptions of the flora and fauna. Patterson went on two exploits: one in 1927 staying for three months during the summer, and the second in the following year staying in country and wintering over with weather reaching 60 below. Patterson was not stranded or trapped in this area, he went by design to experience it. The entire tale evokes memories of Norman Maclean’s “A River Runs Through It and Other Stories,” but anchored around canoeing rather than fly fishing. Yet with Dangerous River, there is nothing but the river and the surrounding majestic peaks and valleys and canyons. Whether propelled by pole or portage or paddle or tracking his canoe, Patterson struggles with nature. There is little bonding with friends, and no mention of family. This is a solitary tale of a solitary man — albeit sometimes with a traveling partner — on a personal journey of wilderness exploration. In this tale it is always the water. To the landed man, water is pretty much water – sometimes rough and sometimes smooth. But to the canoeist, water is always changing – from eddies to whirlpools to falls to cascades to rapids to flat and placid … and that is when it is not frozen. The narrative describes the water on the river along the entire passage in astonishing detail. Patterson’s descriptions put the reader up to his hips in the water. Patterson has a nice easy-going style of writing, drawing the reader back effortlessly. He also has an interesting way of using colons: his prose often sprinkled with them: sometimes right where you wouldn’t expect to see them. All-in-all this is a terrific read. "There is something beautifully final in certain phases of river travel: you make your decision and pick your course, and after that the rest is all action. You are committed, and there is no turning back--you must make it or swamp. The result is a supreme peak of physical effort and a split-second awareness of changing water: and mentally a sort of cold excitement and exhilaration--a high point of living." "The sun slid down the sky and the shadows swung and deepened, but time, for me, had lost its meaning, for I myself was lost in the fascination of this place of wild, chaotic beauty." "I loaded up and let the canoe slip away down Caribou Creek: there was something unusually pleasant about this small river on such a perfect afternoon; through the glassy water I could see the stones fly past beneath me in the riffles and, in the pools, the shadow of the canoe gliding over gravel twenty feet down in the cool, clear depths. Here and there trees leaned out towards the center of the stream, and the canoe slid beneath them in the dappled shadows, green and gold." "We drove the big canoe downriver at top speed, shot through the Figure-of-Eight rapid in one mighty surge and lunched at Faille's cabin." About other men exploring the Northwest Territories: "Greathouse, Southard, and Quinlan. Carl Aarhuis and Ole Loe. The Nordic races were in the vanguard as usual. The first three had a cabin a little way down the Nahanni...Nothing would do but that I should pull in and stay overnight--never mind if it was still daylight. So I went into the warm, dark, crowded cabin and downed some tea with bannock and honey, and limbered up my tongue which had hand almost six weeks' holiday." R.M. Patterson is essential reading for anyone interested in northern B.C. and Alberta exploration in the early 20th century. Emerging from the cauldron of W.W.I. he paddled, walked and rode through the largely unknown north west region of Canada. Dangerous River is his first and possibly his best book. As he said in the foreword to the Canadian edition of D.R. it was"written quickly and in a fit of wild enthusiasm". We are in his debt for this glimpse of real wilderness before civilisation made R.M. Patterson is essential reading for anyone interested in northern B.C. and Alberta exploration in the early 20th century. Emerging from the cauldron of W.W.I. he paddled, walked and rode through the largely unknown north west region of Canada. Dangerous River is his first and possibly his best book. As he said in the foreword to the Canadian edition of D.R. it was"written quickly and in a fit of wild enthusiasm". We are in his debt for this glimpse of real wilderness before civilisation made its impact felt. Dangerous River is no longer in print. It was originally published in 1954. It is based on a number of years spent in the Canadian arctic in a search for "the lost gold" of the Nahanni river region. The author and the men he encountered used survival techniques common in the 19th century (The story takes place in the 1920's). Raging rivers, sub-zero temperatures, tales of marauding indians still haunting a region known as Deadmen's Valley all make Dangerous River a thoroughly enjoyable tale. One of the last adventurers -- I am an armchair adventurer, truly -- my kayaking and camping pleasures do not involve dangerous rapids and year-long isolation, but I sure like reading about it and Mr. Patterson provides it. Seeing the Virginia Falls and Nahanni someday are two dreams. I wonder if they're as magnificent as they were in his day. I can't believe R.M. Patterson's account of his summer and winter spent in a remote corner of Canada's Northwest Territories was out of print for so long; thanks to his sense of humor and adventure, his love of nature, and his writing style--crystal clear like the South Nahanni River itself--Dangerous River ranks right up there alongside other non-fiction travel classics. 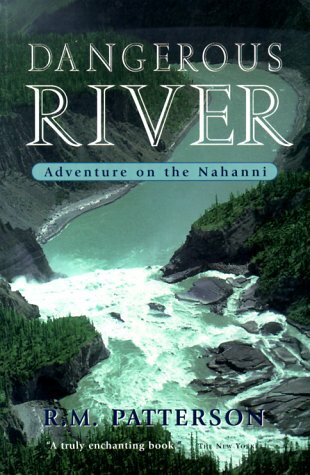 "Dangerous River" was full of man versus nature adventure in the untamed Nahanni River region of Canada and while I found the book entertaining, its journal-like writing style hard to follow at times. That said, Mr. Patterson and his cohorts proved to be equals to every challenge placed before them. One of the best books that I have read about the Canadian north. It's informative, funny and a great adventure. I cannot believe the hardships he had to overcome. This is the second or third time that I've read it and will do so again in a few years. The author is quite a likeable guy. As the back cover says, this was in a sense, one of the last wilderness adventure of its kind, since plane travel was just starting up. I laughed out loud in spots and was drawn into the environment and the story. Excellent true adventure story. Details the journeys of some of the last explorers of an untouched wilderness. Well-written, fast-paced, and not over the top.